So what did 2008 bring then? 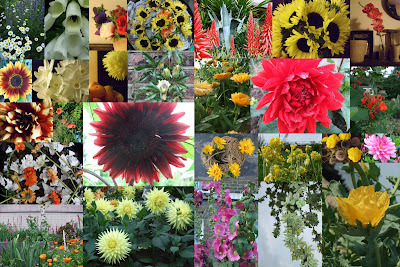 Lot's of flowers obviously, here in the garden, in the wormery, on the allotment, from John's gardens, peeking over walls, at the seaside, from the market, on my favourite skirts. Favourites? Even though I love my sunflowers and dahlias it may be the furcraea longaeva because it was so spectacular. Or perhaps the more modest yellow horned poppy or white foxglove. 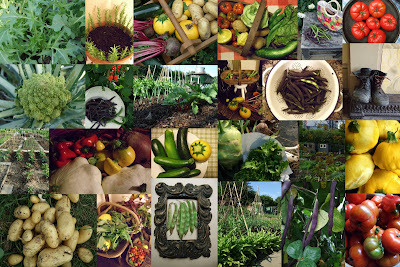 Lots of vegetables too, despite a slow start and such rubbish soil to grow them in. Still yielding even in these cold days - romanesco, mizuna and rocket in the top right hand corner were snapped just a couple of days ago. Hard choice for fave - maybe the six tomatoes for Emma's fabulous Emsworth Village Show. Or perhaps the yellow sunburst courgettes because they are so sassy. There were many trips to the seaside too. And walks along the river and canals. I notice my new black shoes got in on the act; and plenty more shoes - lost and found - appeared on the pages here through the year (obsessive?). There was an archaeological dig, museums and art galleries visited, books read, tentative steps towards knitting and sewing again, inspired by you. 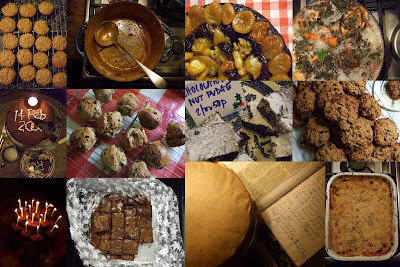 Then of course there was the baking, the marmalade making, the scrumping, the stock stirring, the colcannon fetish, the hundreds of rock cakes for the WI. 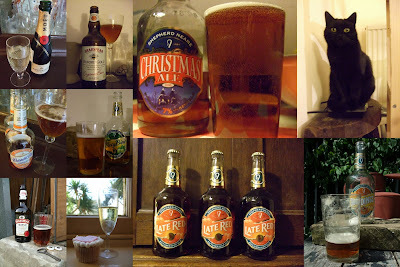 And there seemed to be a great deal of beer drinking (Shepherd Neame) and champagne and various cocktails. Cats lost and found ( not this one, who just happened to get in on the act here). There were three funerals to get through, two weddings, and a new baby to celebrate. A Masters to work on which demanded thirst quenching and chocolate eating, walks in the garden to admire the spiders, towels wrapped round heads and plenty of sleep. A celebration will follow another day. There were trees growing in unlikely places, concrete pavements, autumn leaves, limestone and granite, bollards and groynes. Walks in the countryside, in parks, in back streets and empty corners of London. So here's to an inspiring 2009, lots more to do and celebrate. What a nice end of the year post. I haven't mastered the collage yet to put one together. 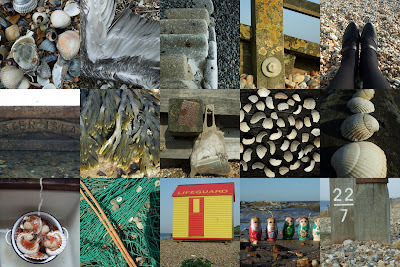 PS Picasa 3 has a great collage tool as well (and it's free). A great 2008 round up. I'm sure 2009 will be just as inspiring so please keep posting! Happy New Year to you and yours.